As summer draws to an end, now is the time to ‘cozy up’ our homes with new warm throws, soft lighting and flickering candles. 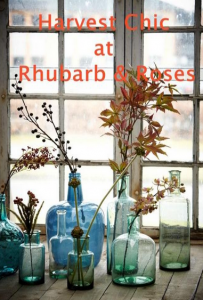 Think ‘Harvest chic’ with unique faux floral Rhubarb & Roses autumnal arrangements. Enjoying the last days of long light evenings and welcome in the gusty , colourful days of autumn. Look at the leaves outside and think of the beautiful displays you could be making in your homes with the lovely sculptural foliage. Take a beautiful vase and place some flowers in it, be it fresh or artificial (we stock both) you can create some truly beautiful arrangements. Not sure how to put it together?… Then pop to the store and talk to one of our team who will be able to advise you on seasonal flora. By visiting the lovely store in Winslow, you will find some lovely products in our ‘Home & Garden’ rooms including furniture, bath & body products and our bespoke limited edition faux floral arrangements. Browse the online store to see lots of lovely products.